Brooklyn's GADADU create a mesmerizing blend of jazz, soul, classical, and dream pop that's impossible to classify but easy to love. They recently talked about their musical influences, their unique approach to the recording process, and John Lennon's knack for interesting chord structures. First, the name: "It's just a phonetic spelling of gotta do," says singer/violist Hannah Selin. It was the band's name for a long time before they found out it's actually a Mongolian translation of the phrase Outer Song, which became the title of their second album, released on 26 October via Birdwatcher Records. This type of random cultural discovery is very much part of GADADU's artistic fabric, as they make music that is wide-ranging and exotic yet oddly accessible. The trumpet melody that runs through Outer Song's opening track, "The Lion", is an exquisite hook that lingers in the listener's brain long after it's over. The electric piano that opens "Chided" exudes comforting warmth as it blends with a rich string arrangement. Their cover of the Beatles' "Julia" puts John Lennon's classic composition in an intoxicating new context. The type of eclecticism you hear on Outer Song (as well as their 2015 debut, And I See Night), is the result of a group of musicians with a variety of tastes and disciplines, in addition to an endless curiosity regarding all genres of music. During a small Northeast U.S. tour promoting Outer Song in November, the six-piece band was temporarily stripped down to three (Selin, pianist/vocalist Nicki Adams, and drummer Arthur Vint), and they spoke to PopMatters before playing a gig at O'Brien's Pub in Allston, Massachusetts. "Nicki and I actually started out as a duo," says Selin. "It was after we'd been together as a couple for about a year. We started playing some songs – I was living in Philadelphia and he was in New York – then I went to grad school in New York for composition, and as soon as I moved there we began looking for other musicians." It wasn't long before the current configuration of GADADU was in place, with the exception of Vint, who joined about year or two later, and tenor saxophonist Ayumi Ishito, who joined after the recording of Outer Song. Rounding out the ensemble is Daniel Stein on bass and Nicki's brother Patrick Adams on trumpet. Prior to her move to New York - where she has received multiple compositional commissions - Selin studied classical viola at Oberlin Conservatory and worked on a number of sound installations in her native Pennsylvania. But her high school musical tastes have also informed much of what makes up the songs she writes for GADADU. "I listened to a lot of Bjork and Radiohead," she says. And while Selin and Adams write all the original music for GADADU, the band members' jazz backgrounds that help give the music an added dimension. "All of us except for Hannah have jazz backgrounds," says Adams, who's performed with everyone from Cuban jazz drummer Francisco Mela to afro-punk musician Ebony Bones as well as psych-soul band Votive Crown and his brother's band, earthTone. "We're all involved in various projects that go in many different directions." Vint, for instance, leads a band appropriately named Arthur Vint & Associates, who record albums with an Ennio Morricone / spaghetti western twist on jazz. "I play everything from country to Dixieland and everything in between," Vint says, adding that his Associates project is preparing to perform at a Morricone 90th birthday celebration in New York as the Outer Song tour winds down. The variety of musical tastes at play helped shape Outer Song in ways that may not have been apparent in when Selin and Adams first presented the songs. "Each of the band members' sounds came together to make the album," says Selin. "Sometimes Nicki and I have ideas for the arrangements but often everyone else will contribute their ideas and their sounds to those arrangements." Selin added that the way she and Adams write songs tends to incorporate a lot of the different styles of music they absorb as listeners and fans. She points to personal favorites like Australian future soul quartet Hiatus Kaiyote and the experimental genre-hopping of Flying Lotus as big influences. "We took that broad spectrum of sound that you hear in Flying Lotus music and production and went for some of that on some of our songs," Selin says. "At the same time, especially with 'Bay Songs' (an Outer Song track released as a single in 2016) I was also writing an orchestral piece, but the band version is like pop and jazz meeting with orchestral sounds and form." The wide influences, coupled with playing different types of venues with a variety of different bands – their recent set at Brooklyn Bowl paired them up with jam band Tea Leaf Green – speaks to their willingness to break down boundaries. "I think it's a conscious decision to try to have a broader appeal," says Vint. "Taking lots of different influences from different kinds of music not just because we like it, but maybe also because it will cast a wider net." The lengthy gestation period of Outer Song allowed the album to go through a series of concepts that transformed the songs. "When we were first recording the album, we had a simpler concept in mind," says Adams, who only started playing synthesizer when he moved to New York since he couldn't get a piano in his fifth-floor walkup apartment. "But through the whole process we started thinking, 'What else can we draw into this?' So we began adding synth layers, strings, all these influences." "Initially we recorded everything live in the studio as a five-piece," says Vint, "But these guys (points to Selin and Adams) had all these other ideas. Hannah started layering the vocals, Nicki was adding a lot more synthesizers, and they brought me in to do some extra percussion on a couple of tracks. It really changed over the course of time, in a good way. It was just adding layer upon layer. If you were to listen to the original tapes versus what we came up with, it's extremely different." One of the more interesting and revelatory moments on the new album is the one cover song, a dreamy, jazzy take on the Beatles' "Julia." This introverted, deeply personal John Lennon composition took on a life of its own with GADADU's arrangement, thanks to enthusiastic Beatles fan Adams. "I love the Beatles," he says. "Back in middle school when people were into Blink 182 and Green Day, I was wearing Beatles shirts that I made at home. I think John Lennon was always really good at matching melodies with interesting chords. The way that he writes with chords is not necessarily conventional pop. There's a sort of an openness to it in my mind." 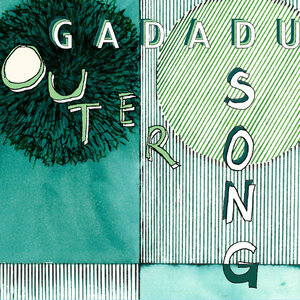 With Outer Song released and their small Northeast tour wrapped up, the members of GADADU are busy working on various other projects. Selin, for instance, is continuing with her own composing, including a song cycle based on the poems of Adrienne Rich that will be performed by the Brooklyn Metro Chamber Orchestra in May 2019. But fans hungering for more GADADU material – in addition to more touring - can rest easy. "The next big thing for the band is getting into the studio and recording the next album," says Selin, "sometime in the next four months or so. We have more than another album's worth of new material."